Ooey, gooey, melty, yummy, they’re calling your name! Photo by Brenna Arnesen. get huge props for helping me beef up my skills to master chef status, especially when I lived on my own before getting married. I still tend to prefer using recipes when making meals, but as I gain more confidence, and the realization that not all recipes make perfect sense, I bravely make my own modifications and start trusting my own burgeoning culinary instincts… which is super important for every cook. I’m maturing as a cook because lately, more than in previous years, I am now making up my own recipes. This is a huge step for a girl who is a cookbook maven (they are piled by my couch all the time for leisurely perusing and inspiration) and who has stuck to recipes much like a religious dedication to algebraic equations. I didn’t veer far from cookbooks, partly because I wanted to train myself by learning to follow a recipe verbatim and educating myself on process and terminology. But now I’m taking creative risks in the kitchen, and this is helping not only my cooking, but my whole outlook on life. Every time I cook, even though I’m using the same ingredients, it’s a new experience and new result every time. That’s the art of cooking. One of the best ways to let your creative juices flow and have fun in the kitchen is to invent your own recipe. Not out of thin air, mind you, out of the inspiration you’ve gleaned from any fantastic eateries you have frequented. It only makes sense to borrow from the best and riff on them in your home kitchen. Most restaurants have their menus posted on their websites in PDF format, so you can refer back to the ingredients, or you can jot them down/take a picture with your phone when you’re dining there. One such recipe I vowed to recreate at home and did — successfully, and even upped the nutrient quotient! 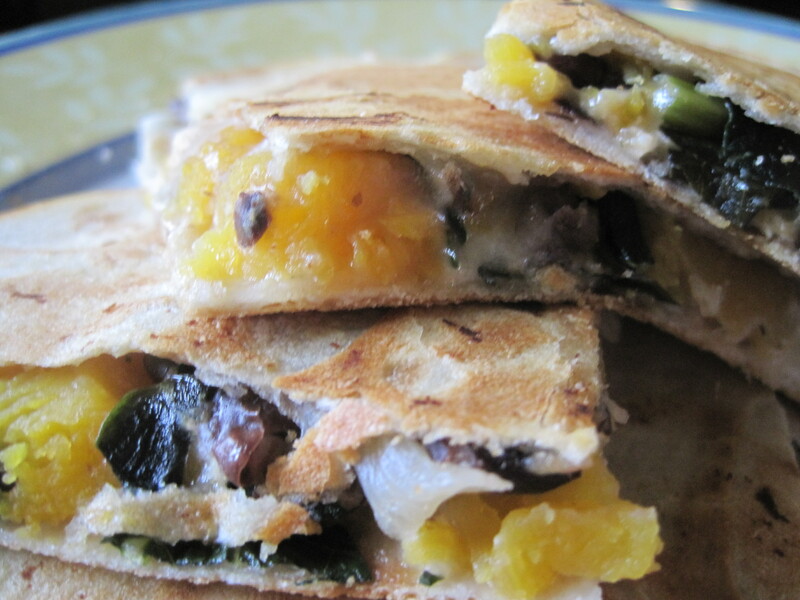 — is butternut squash quesadillas from The Matador. Just uttering the phrase “butternut squash” puts me in a very happy place, so much so that I will order whatever item that is on the menu that has been blessedly paired with the saintly squash. It’s one of my favorite foods, obviously. And this has become a new favorite recipe — made in a cinch, loaded with fiber and nutrients, and heartily filling. I just added the black beans and kale. You can find precut butternut squash at Trader Joe’s and if you would rather save time than money, this is well worth it. Of course, it’s not hard to prep an actual squash, but again, this requires planning ahead. Purchase the quantities you need… this recipe paints in broad brushstrokes. Slice or dice the onions (your call) and caramelize in olive oil (high heat first, then lower heat to saute). Add pieces of kale and saute. Add the cooked squash chunks and the rinsed black beans and warm through with the other ingredients. Move your filling to a separate dish. Take two flour tortillas; on one spread some of the filling and then crumble over some goat cheese and pepperjack cheese to your taste. Top with the second tortilla to make a frickin’ rad quesadilla, plop in a medium warm skillet to melt the cheese and heat through the middle, then flip to finish off the cooking. This entry was posted in Food, Food for Thought and tagged butternut squash quesadillas, cooking, easy recipes, food, food for thought, gourmet food, healthy cooking, humor, recipes, writing by The Rambling Vine. Bookmark the permalink.